I was curious, my curiosity sometimes gets the best of me. I wondered if they were the same, I wondered have they changed? Are Far Guy and I the only people in the whole world who noticed. One day I couldn't stand it anymore. I drove down the drive, and stopped at the top of the hill to take a photo..nothing has changed, well that is not quite true, lots has changed..but the trees remain the same. We drove down the drive further, we stopped to visit with Dave. I told him of our mission that day. He has lived there about 5 years and he has never noticed. I took another photo looking uphill. Can you see it now? It is OK if you don't notice anything..honest. You have to be really in-tune with your surroundings in order to notice. On a side note the "Poetry Tree" made it through another winter..a long time ago our daughter Jen wrote a poem about this tree it is the Popple that is leaning into the driveway on the right side of the photo. There are places I remember. That song has been running through my head since yesterday. I believe it is correctly called "In My Life." It was a hit for the Beatles. I remember when the Beatles became popular, my Dad called them "Long Hairs" ..looking back they were pretty radical for the time. By today's standards they were pretty tame and harmless. You have to recall that most guys wore crew cuts back then..so they were really "long hairs" in comparison. I believe my Dad also called them girls, because of their long hair. I remember the directions Far Guy used to give kids looking for his house. "I live right across from the Smokey The Bear sign." That sign has not been moved in over fifty years. Although the color of the house has changed, it used to be white, Far Guys Mom would never have painted it grey. The house is still the same. Some have gone and some remain. It is the only house on the block that remains. The rest of the block was sold and a Casey's Gas Station and Convenience Store occupies the old neighbors space. Someone planted a Forsythia and something pink flowering. There is a new sidewalk out front, but the alley outback is still the same. Far Guys Mom would have never allowed all that junk in her yard either. This is a photograph that was taken 58 years ago, in the spring of 1952. 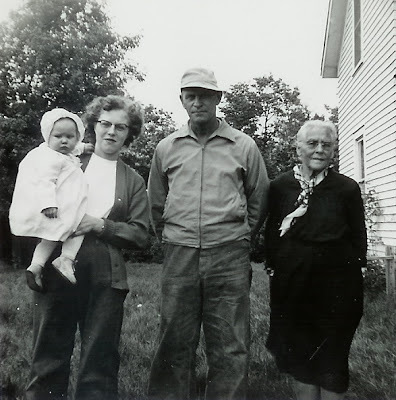 From left to right, me and my Mom, my Grandpa, and my Great Grandma Hatwig or Hattie.. A four generation photo. This is the oldest photo that my Mother has, it may have been taken in Germany. 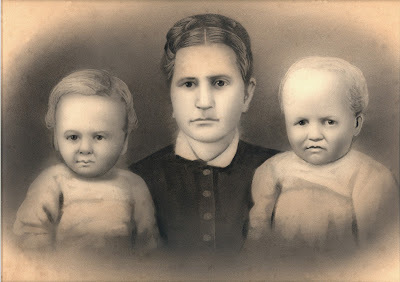 The children are the twin sisters Hatwig and Elsie photographed with their Mother who would be my Great Great Grandmother. From my work with old photos, this is a remarkable image from 1880, 1881 or 1882. Part photograph and part drawing. The twins were born in 1878 and they came to the United States to Missouri when they were four years old in 1882. This photo may have been taken in Germany before they left for the United States. Can you imagine another Grandma in Germany having only this photo to remember her grandchildren by? How sad she must have been to see them get on a ship. Times were different then, I guess that if your children had no hopes of owning their own land you would want them to move and go wherever they could make the lives of your Grandchildren better. Last year I told y'all that I would remind you that May Day was coming up and you should get your butts in gear and make some May Baskets and fill them with candy and or flowers and deliver them on the coming of May. May Day is this Saturday!! Last year I was told..no one does May Day Baskets anymore..well excuse me..I do..and many of my readers thought it was a great idea, and they could remember doing it as a child. Some had never heard of this May Day Custom. When I was little we looked forward to May Day, baskets were always made, filled with candy or cookies. They were loaded up in a cake pan and delivered one by one, you ran from the car to the house and put the basket on the door knob and then ran back to the car. If someone came out of the house they were supposed to chase you and kiss you. After our deliveries we went home to wait for someone to deliver a basket to our house, which wasn't hard to watch for..we had a fairly long driveway. I will make some baskets and deliver them to my great nieces and nephews filled with skittles and fruit roll ups, and I will probably make Hooch and Odda a basket with dog bones in it. This is a holiday that I enjoy..I don't have to cook or clean or get all dressed up. I don't have to shop for days..buying the wrong thing, May Day is one of those days that I don't have to pretend to enjoy...for me it is one of those effortless fun days. 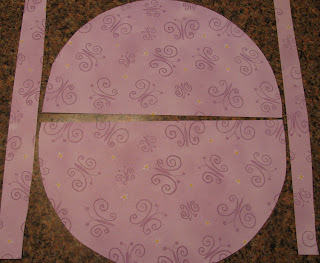 I made a pattern using a plate and a plain piece of paper. I made the first one too large, I folded down the straight edge til I got it right! I then transferred the pattern to a piece of 12 X 12 scrapbook paper..twice.. centering the half circles, that way I still have two straps for my baskets at each edge. It isn't rocket science...I formed the cone and used a stapler to hold it in place, then you attach the handles..viola a May Day Basket!! You could have small children that like to color, do their own designs on pieces of paper..I was tempted to do some coloring myself! I miss coloring, my grands hardly ever color anymore. You could buy some cups and make a handle out of a pipe cleaner, you could decorate the bottom of a cake mix box..you could just let your imagination run wild. I have been Loony for three years now! We are very fortunate here in Minnesota to have an individual by the name of Larry Backlund who has a Loon nesting platform near his dock on a small lake in Minnesota. This is a project that is near and dear to Larry's big ole Loony heart. The Live Loon Cam is up and running, I have a link to it on my sidebar...on the left.. This year Minnesota Bound ( The web site that hosts the Live Loon Cam) has added some extra features. There is sound!! AND a Night Vision Camera..so the loons will be visible 24/7. Larry has a loon blog, and there is a forum for questions and observations. Larry gives up the use of his lake shore property so that the Loons have a safe place to nest, he built a platform and supplies it with cat tails and weeds. The Technical Crew comes in and sets up the Cam and all it's various connections. After the Loons have hatched their young they will leave the nest, and Larry can have his lake shore back again.. he follows the Loons and their activity on the lake very closely. Once the eggs have been laid the Loons will never leave the nest for very long. They trade spots day and night, wind and rain..Loons are very devoted to their eggs. In 2008, my grandsons were here when we watched the first chick go for his first swim. It was a wonderful sharing experience. I hope you enjoy this years Loon Experience as much as I will ! I have been doing some reading about Common Loons (Gavia immer) ..I just love those scientific names! Imagine yourself a Male Loon...you have had a foot loose, fancy free winter in the south. One day something says fly north...something draws you to the nesting site you had last year. Finally the ice is out and you use your magical calls to establish your territory. Then you wait for your mate, when she finally shows up..you are really happy to see her.. "Hiya Toots"...lets get on with the laying of the eggs! You are both tireless parents, taking turns on the nest..then spending most of the summer rearing and protecting the chicks. One day you say, "Time to go junior or juniorette...hope you have a good loony life." You and your mate take off to gather with friends, and head south. You might see your mate over the winter, you might not, you may be 100 to 1,000 miles apart.."See ya at the lake in the spring Toots. "Such is the life of a Loon..fascinating creatures! Last weekend after "grandsitting" we high tailed it to Detroit Lakes, Minnesota. There was supposed to be a huge train show there and Far Guy had been looking forward to it for months. When we walked into the mall we both looked at each other and said "This is it?" One track with a couple of old guys and a kid, nothing to swap, nothing to buy unless you want to go to the Hobby Shop. Far Guy was so disappointed, I felt sorry for him. It was a good set up to create awareness about the hobby of trains, it was just not the type of train show we were expecting. Yesterday we travelled 3 hours to a real train show, a swapping, bargain, everything you could ever want to find under one roof train show. Far Guy was a good shopper..he got one piece that was part of his original train set..Lionel (his engine and coal tender are from 1951)..magnatraction.. and O scale in train talk. When he gets the "new/old" piece cleaned up and working I will take some photos of it..I have been hearing about this piece for years. We are still looking for the helicopter that flies off one of the flat cars..and the logs that are unloaded from another car. Oh and a Desoto car that is less than 165 dollars, maybe at an estate sale or an auction..you never know. It is good to have a hobby where you are always looking for something, the hunt is part of the adventure. Now who in their right mind would buy this? A brass train..I asked if I could take a photo..they said "Knock yourself out" It is beautifully exquisite..but at a thousand dollars for two pieces..I will wait until I win the lottery. I visited with a number of men, these train guys are really friendly, the place was packed..you could hardly walk. Far Guy was like a little kid grinning from ear to ear! I took his first few bags of treasures out to the car and walked Chance in the rain..then we sat in the overhang of the building and enjoyed the rain falling. I did make one purchase. Something for Far Guy to add to his collection on the wall upstairs in his train area. I have always been fascinated with the lifestyle of Hobo's..just travelling from one town to the next on the trains. Carrying everything that is important to you in a red hankie tied to a stick slung over your shoulder. This conversation revolves around Adam, who is eight and the baby of our family. He is in second grade. We "grand sat" recently while his parents were at a conference. He listened well all evening, he complained only about a hole in his sock. At bedtime he told me the rules.
" Grandma, I get tucked in, we cuddle and talk about what we are going to do tomorrow, then I say my prayers and you listen." OK..I can do that. We talk about the next day and how difficult he is to wake up..and that I am going to let Chance wake him up by washing his face. He blesses everyone in the whole Universe..he wouldn't want to leave anyone out. I am dismissed, "Grandma, you can go now, turn down the light, but don't turn it off." The next morning he is a bear, well I am a bear in the morning too..I like to wake up on my own. I have been awakened by the tween boy child taking a half an hour shower. He is an early riser and likes to be up for one hour and forty five minutes before he leaves for school. The bear must be snappy as he has only forty five minutes. "I want Strawberry Pop Tarts Grandma" No Luck..he has to settle for Toaster Strudel and chocolate milk. "I want socks without holes in them" "My Dad put Noah's pants in my drawer again..geesh..he always messes it up." "Don't look Grandma..I have to change these pants." "I am not looking Adam, my eyes are closed tight..now lets hustle." At the table, I load them up with stuff for lunch..they pack their own lunch bags. Adam says " Today I am taking all my stuffed animals to school." I said "I don't think so, pick one and put it in your backpack." We banter back and forth. Noah said "He is just trying to pull one over on you Grandma." He stuffed two in his backpack..
After school, I asked "How was your day?" " Fine, but I got a hole in my sock" He was elated when I told him that he and I were staying home while Noah and Grandpa went to guitar lessons. He had a friend over to play. They played well..it was one of his trouble maker friends. But we had no trouble. At bedtime, Adam told me "I have something that has been bothering me for a long time. It is my friend, he does stuff and then gets me in trouble, I get blamed for stuff he does." There were big alligator tears..the ones that just well up and make your eyes look all glassy. I suggested that his friend was a troublemaker, and that Adam should just keep his distance. "But Grandma, he doesn't have any friends." 'Well Adam, maybe if he realized that his behavior is losing him friends..he will wake up." "But he is really funny Grandma, sometimes he does stuff to make you laugh." In Class?? "Yes, I am tired now Grandma." We have to remember to read tomorrow Adam..would you like to read Grandma some of the Dumb Bunny Books? "Sure, I am really tired." He said his prayers, again blessing everyone in the entire universe. He said "You can turn the light down now, see ya tomorrow..my Mom and Dad are coming home tomorrow..Right? " "Right Adam..tomorrow they will be home." We call this place Turtle Slough..the Aspen ( Piss Popple or Populus deltoides) is breaking bud. You can see it in the background..a fine misty green. Yes, I know it is not much..but it is a beginning! We have two kinds of turtles in our area, Snapping Turtles ( I hope I get to see one again this year) and Painted Turtles or what lots of people call Mud Turtles. Painted Turtles brumate all winter. This less active state of brumation is brought about by cold weather and the decrease of daylight. They dig down in the mud and their metabolism slows down, they do however drink water from time to time so it is not called hibernation. Anyway..the turtles are now out and about and doing what they do best in the spring..Bask. They must bask in the sun, they rely on the warmth of the sun to warm them enough to digest their food. Sometimes this basking leads to some other activities. Far Guy said "There is a cluster of basking happening right here before our eyes." Ah spring fever..how often have you been at a good old fashioned Turtle Tryst? There was a wayward turtle that needed rescuing... Chance was afraid of it..the big chicken. 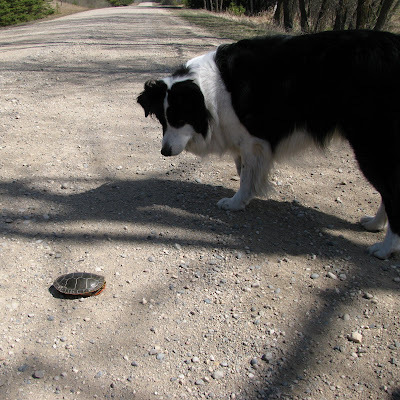 This turtle might have had a hot date on the other side of the road. He was getting there slow but sure..
Far Guy helped it get across the road..safely out of the way. Chance stayed safely out of the turtles way. These little turtles can make a hissing sound. 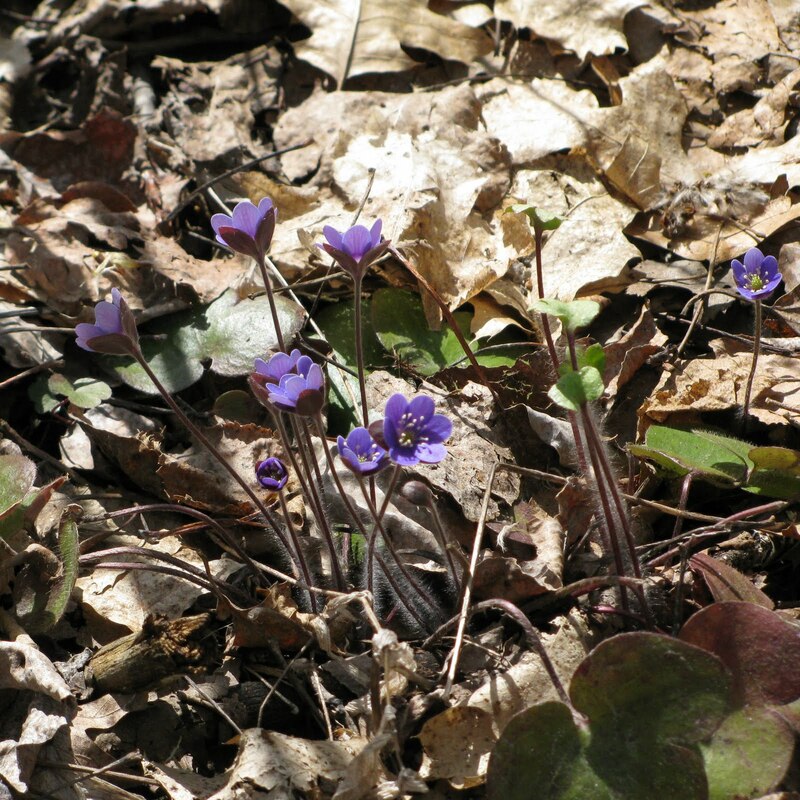 Up here in the sticks the Liverleaf or Hepatica americana is a native spring ephemeral. 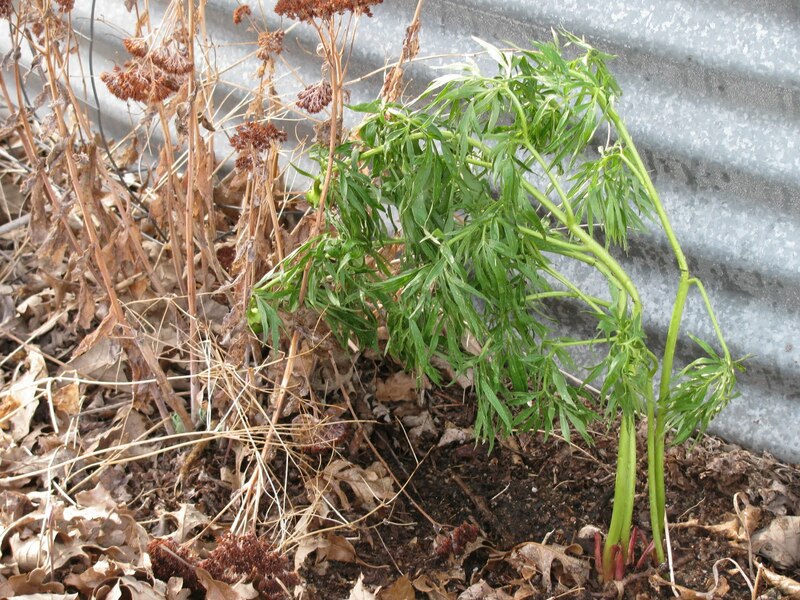 These plants retain their leaves during the winter, the older leaves turn a reddish brown color and the new leaves are green. They shoot up their flowers skyward to capture the warm rays of the sun before the leaves totally obscure the suns rays from the forest floor. This is Round Lobed Hepatica. It will usually start out a purple color and then fade with time..it can be found in any color from purple to pink to white. A beautiful little plant that just shouts SPRING! It is a short lived shout..so you better pay attention!! I am so glad I was able to capture it. This is Far Guy's Confirmation Class. This was probably taken in 1964 or 1965. ( I marked Far Guy with a red dot!) Far Guys Dad took this photo, or someone that had his camera..I can tell because it is a polaroid. Eighteen kids were in this class..Pastor Malotky had his hands full (He is also the Pastor that married us in 1969). 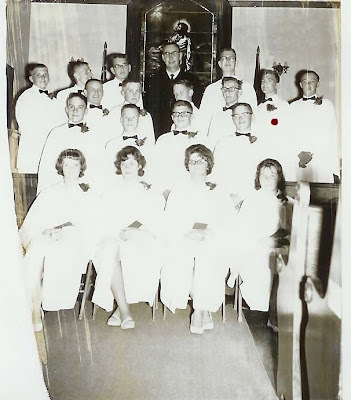 In the Lutheran Church Missouri Synod children are forced to attend confirmation classes for two years..back then it was Saturday mornings. So lets see..you go to school five days a week, then on Saturday you still have to get up to go to Confirmation..and then Sunday of course there is Church. In the spring there is fishing, and two of these teenagers had fathers that were going off fishing. The boys who I will not name..but I dated both of them.. promised as God was their witness if the Pastor would allow them to go fishing that they would attend church every Sunday for the rest of their lives. Memorization..when was the last time I consulted the "what does this mean" part of an article or a commandment.. I will tell you when..in confirmation. Far Guy had to memorize them and say them out loud if selected. In my confirmation class, our Pastor was old and he let us say them as a group. So we used to play hangman during confirmation class. We didn't have a proper classroom in the old country church, so we just sat in the pews of course no one ever sat in the front pew. So you could hide out behind the high backed pews and play games all morning. Our Pastor was old and plump, once he got sat down..he hardly ever got up again until it was time to waddle to his car. His car was an instrument of God..one day in the spring..the culvert was out and his car and God flew him safely to the other side. Fern-Leafed Peony From A Friend! 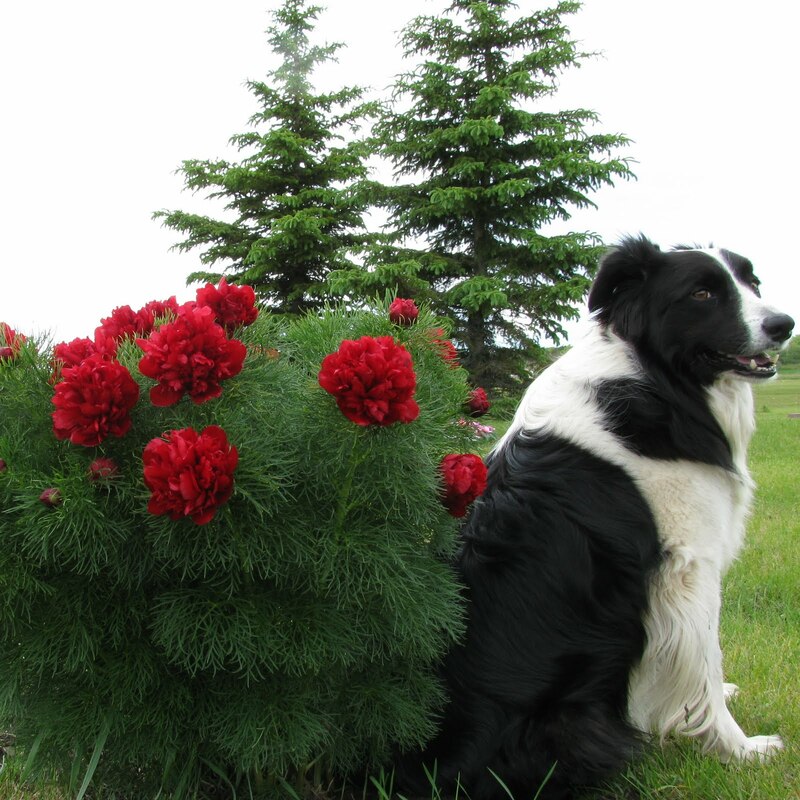 I had a beautiful fern-leaf peony when we lived in North Dakota. We sold the house in April and moved in late May, I had no place to move it to. I had splurged on it, at that time they cost 25 dollars. It was one of those plants that I grieved for. Not your normal run of the mill peony, the foliage is highly divided..fern like. The roots only went up in price..I believe they maxed out about 50 dollars for a root. I never wanted to part with that much money for one plant. When we moved here, I discovered a plant at the local cemetery, it adorns the grave of a child who died during a routine surgery. Chance and I visit this plant and this grave and pluck weeds..waiting for exactly the right light to capture this plants beauty. I took this photo last year. Yesterday in the mail I received a very healthy Peonia tenuifolia 'Rubra Plena' root complete with foliage and two buds from Iowa. I don't remember exactly what I told Larry of Larry's Creative Zone, he had been moving plants from his Mothers house to his house..I probably said "You have a real goldmine there with all those roots..you could sell them and retire in style." or " I am really coveting those roots of yours! " Anyway Larry being the kind generous person he is ..shared with me!! I am just pleased as punch, I would do a cartwheel if I didn't think I would break a hip. OH, I never was any good at cartwheels anyway so just imagine an old lady standing and clapping in the woods..a standing ovation for Larry! The pocket gopher (Geomys bursarius) is a burrowing rodent. He is a digging machine, his teeth never stop growing, his ears have valves he can close while digging, his hearing is poor, he has weak small eyes and his front feet have large claws. He is called a pocket gopher because of the pouches in his cheeks where he carries food. 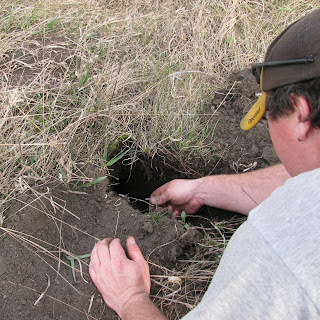 Gophers live a solitary life, tunneling underground..eating roots and surfacing to eat above ground or to pull an entire plant into their tunnel. They are a pain in the neck for farmers. An acceptable way to get rid of them is to trap them. I learned how to trap gophers when I was just a kid. My brothers and I had a trap line..back then we got 10 to 25 cents for a pair of front feet. 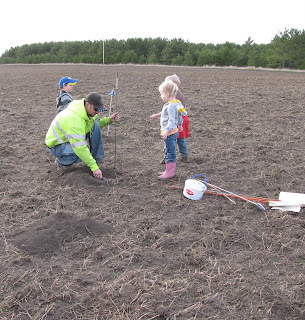 In Minnesota, each township can decide to put a bounty out on pocket gophers..currently I believe the bounty is $2 for a pair of front feet..inflation.. Yesterday I went along on part of the trap line that my Nephews have set..they check the traps at least once a day..with their children..my great niece and nephews. If the sight of a dead gopher bothers you or severed feet..you should bail now.. The twins got their gear out of the truck, they explained to me, that the jelly jar was just for the feet and all the jelly was gone. Jordan has the jar, and a shovel. Gavin has the clipper. Off we go..singing "Greasy Grimy Gopher Guts"..not really but you get the idea. Hunter placing a trap. This one was at the edge of the field. The group, working together..checking traps. Josh digging out a hole. Dead Gopher Warning..your last chance to bail..
Jordan..the chief scout..has declared that there is one in the trap.. indeed their was..a fat one too..all the kids commented on it's fatness. I will spare you the clippers..but the feet ended up in here..
Our eldest daughter and our second granddaughter have birthdays one day after the other. They are 26 years apart..Maddie was 12 this year and our daughter is now..ahemm..38. 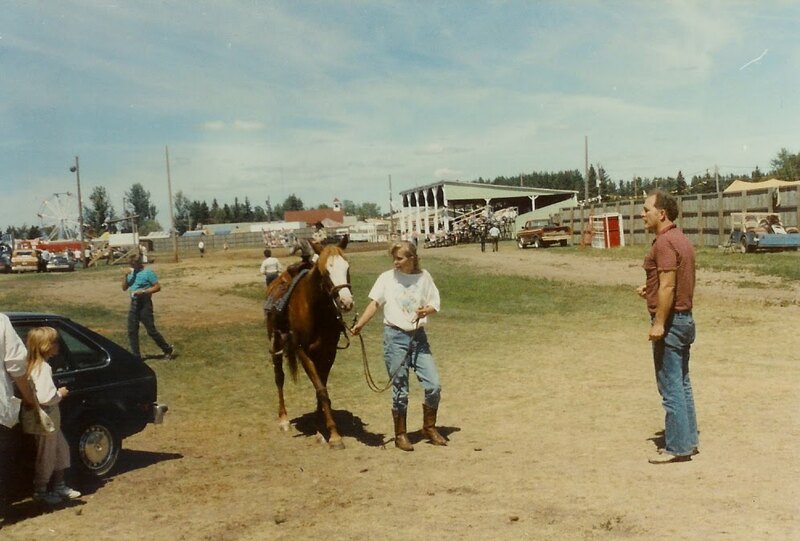 Uffda that makes you feel a tad old..
Maddie loves horses..this was one of her very first horse rides..she was absolutely thrilled! (Thank you Amanda and Leah!) She talked about this horse ride for years! Last Summer she spent a week at my sisters really learning how to ride. Maddie would like nothing better than to have a horse..unfortunately they live in town. 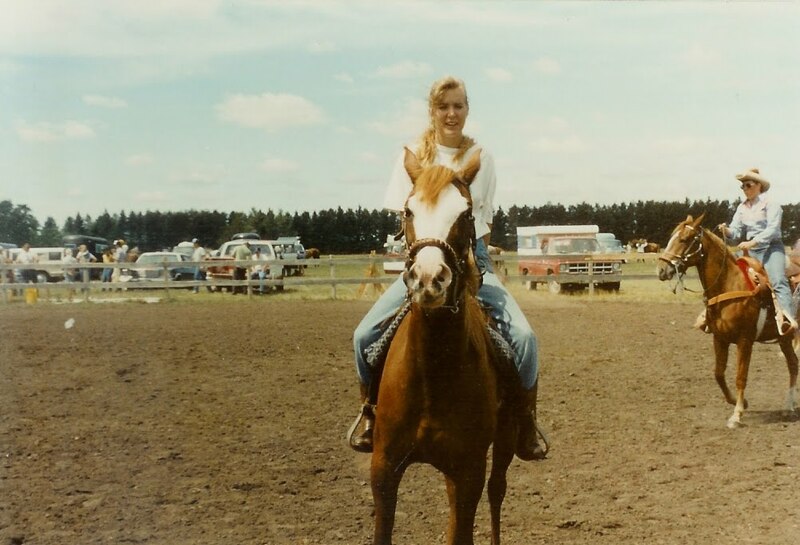 Her Mother was also a horse nut, she eventually did get her own horse when we moved from the city to the country. These photos I found recently..Farrah and Trica during a 4 H share the fun at the local county fair one year. I don't think the horse was so thrilled with all the activity..but she survived. We have been Grandsitting up north. The boys are in school during the day..so the animals entertain us. Little Elvis is the "King"..he is about 5 months old now. He is terribly spoiled. Far Guy calls him a terrorist dog..no one is safe from his advances. He is fearless. He is a tri color Shetland Sheepdog. He is king of the couch. He is king of the coffee table. He keeps up with the pack during a game of ball. He is easily distracted by the wagging tails..and often grabs them. He also nips at heels and back legs. Miney responds by growling at him, yesterday she head butted him..you would have thought she was going to kill him..by the high pitch squeal that escaped from the little devil. Chance also growls and makes throaty noises ..subtile communications continue..the three of them make quite a pack. Redwork was popular a long time ago. Penny squares were purchased with designs stamped on them to embroider, typically designs would be of women in huge hooped skirts. Young girls were taught to embroider, because it was a life skill they would use..in handiwork or patching clothing or in gaining employment as a maid. I learned to embroider when I was about seven or eight..I had my own wooden hoop, threads and needle..being admonished to never lose my needle. I recall getting knots in my thread, and going from one side of my hoop to the other on the outside of the hoop, cutting my thread too short so that I couldn't tie a knot, pulling too hard on my thread..making holes in my fabric..not pulling hard enough and having lazy threads that could be snagged. Searching for hours on my hands and knees on the floor for the needle that I lost. Always looking at the back of my work, after all the back should be a pretty and neat as the front. Learning different stitches, the lazy daisy, the satin stitch, the chain stitch. Proudly adorning the corner of a flour sack dish towel with a flower design, never getting to do a dresser scarf or pillowcases till I was much older. I taught our daughters to embroider, then I taught them to Cross Stitch..Trica even knows how to crochet!! Life skills..I did not do so good teaching them to cook..but they could sew on a button. My Cousins group makes a quilt every year to give away at the family picnic in August. Tuesday we got together and began quilting it. We each embroider a square and Diana puts the squares all together with borders and we put it on a frame and hand quilt it. If you notice yellow marks..that is the marking pencil I used to trace around a dinner plate for part of the design. Monday mornings meeting included another discussion about me. I needed to go to the Vet for my annual checkup. There was a little discussion..and this time they agreed..I am feeling a bit "off." Far Side said maybe I ate something that I shouldn't have, or that Far Guy snuck me some milk from his cereal. Far Guy said "Nope, I haven't snuck him anything lately." 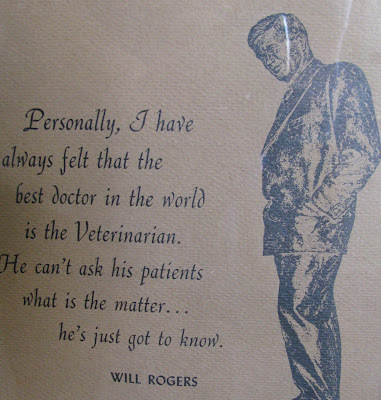 Far Side had talked to Patty on the phone, she is the Vet Tech..it was decided I needed a special blood test. A SNAP 4Dx test. It is four tests in one..and costs 65 bucks. It tests for Lyme disease, Anaplasmosis, Ehrlichiosis and Heartworm disease. It takes ten minutes to get the results. 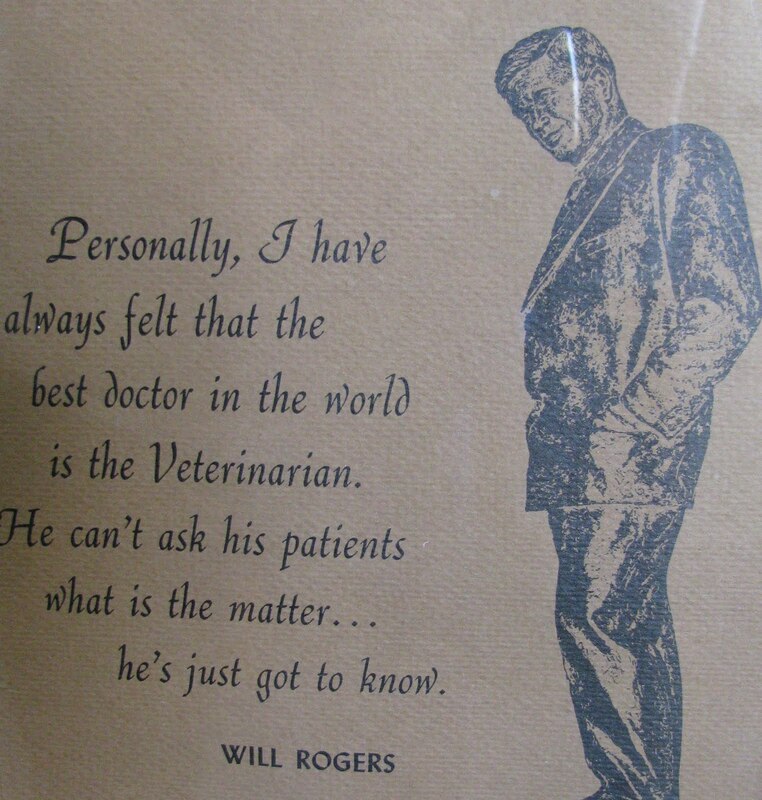 In the meantime, I got my checkup..Paul says I am looking good. I got weighed..I lost 2.5 pounds and now weigh in at 52.5 pounds. He got all my shots ready..I didn't even flinch. Then he lowered the boom, he is retiring cause he is 61 and wants to stay at home and fish and play with his dogs. This of course made Far Side bawl, and she doesn't bawl often..so if she does you better pay attention. She was remembering all the phone calls that were always answered, and the times that she stood next to the very table I was on for a last goodbye. 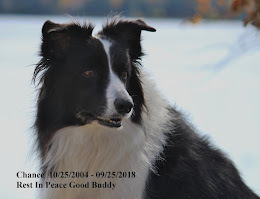 None of her and Far Guys dogs have ever died in their sleep at home..all those decisions have had to been made..the really hard decisions, but the necessary ones you have to make when you are a responsible pet owner. The new Vet will take over in June and her name is Gretchen and she is from Colorado. I hope she likes Border Collies! The blood test is done, I have Anaplasmosis. It is treatable, I have to take two pills (doxycycline 100mg) in the morning and two pills at night ( wrapped in lunch meat or surrounded with peanut butter..yummy!! ) for 25 days. Paul says I should recover fully. Anaplasmosis is a disease that is carried by the little itty bitty deer ticks or black legged ticks. There is no vaccine available for it. It is a silent infection. The symptoms are Lack of Energy ( Yes ..sometimes) High Fever (no) Swollen Painful joints (No) Loss of appetite ( yes) Vomiting ( I did throw up twice last week) Diarrhea ( I had some soft stools..and one episode of the hershey squirts). The stress from going to the groomer a week ago seemed to kick off something..plus I have some spots all along my spine..just bumps that came last Saturday..bumps that have bled and form a scab..and if the scab is removed..I bleed..the spots itch. Far Side says I might have been allergic to their shampoo. The Vet said it is something I got at the groomers. Anaplasmosis is carried by the little tiny (size of the head of a pin) tick that is found in our woods from March til November. I get checked several times a day..I wear Frontline and we have extra frontline spray for when they get really bad. Those deer ticks are everywhere..because the deer population is way up..and they carry the adult ticks until they lay eggs..the little eggs hatch into larvae that feed on small mammals like mice, voles, and moles, maybe even those squirrels and chipmunks I like to chase. The larvae molts to a nymph..the nymphs feed on the blood of a dog (Me) and gave me the infection. If allowed to stay on a dog (or deer) ..the ticks molt into an adult tick capable of laying eggs again..it is one vicious cycle.